When Mummy Cow announces that it’s time for bed she’s not surprised when her little calves say no. After all, resisting bedtime is just what kids do. 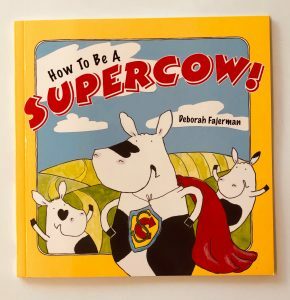 However these siblings have a very unusual reason for not wanting to catch some Zzzzs – they’re Supercows! Bentley is a cute little rhino with an exuberant personality. He throws himself in to situations with gusto – but unfortunately this often gets him in to trouble as he has no concept of his own size or strength. Something that will be very familiar to parents/carers of toddlers! At breakfast he accidentally smashes his boiled eggs. He cracks the ceiling getting ready to leave the house for school and causes mayhem playing tag at playtime. He doesn’t mean to be so rambunctious – he just is! 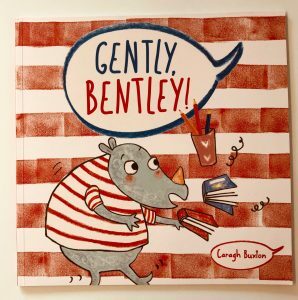 ‘Gently Bentley!’ is repeated frequently throughout the book as his parents and teachers try to stop him from breaking everything in sight. But then one day he goes home and there is a tiny new baby, fast asleep in her crib. His mum and dad hold their breath as he approaches. Surely he’s going to wake her up – or is he? Steve Antony has only been on our radar for a few months but in that time we’ve bought (and loved) 3 of his books and have many more on the (frankly huge!) list of titles that we absolutely have to add to our collection at some point. This is our first foray in to the world of Mr. Panda (there are 4 in the series) and Ivy is a big fan! 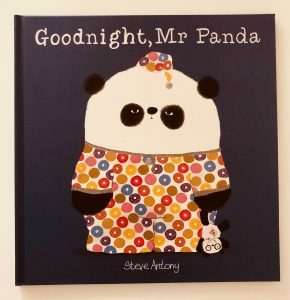 This one follows Mr. Panda and his friends as they get themselves ready for bed. Mr. Panda seems to know what he’s doing – he has a bath with his rubber duck, dries his fur, gets in to his pyjamas and brushes his teeth with minimal fuss but his friends are a bit more difficult. Hippo refuses to brush his teeth, Skunk won’t have a bath. The sheep don’t want to wear pyjamas. And the sloth? Too tired to move let alone get ready for bed! Finally everyone is ready but Mr. Panda has forgotten to do something very important. What could it be? Operation potty training is due to start shortly so we are currently reading lots of books on the topic to help her understand what’s coming. This one, from the Big Steps series, has quickly become her favourite and we’re currently reading it 3-4 times a day at her request. 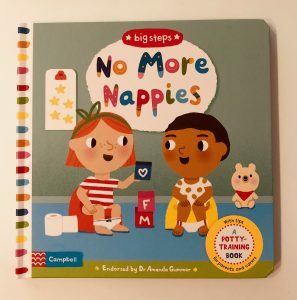 The book shows two toddlers, Millie and Mo, as they start their potty training journey. At the beginning of the books they are both wearing nappies. You can lift up Millie’s skirt to see her nappy and you can also use a slider to pull Mo’s nappy down and reveal his bottom which Ivy thinks is hilarious. They don’t want to wear nappies any more, so we see them visit the shop with their Daddy to buy potties and grown up pants. They learn how to use them and the book reinforces the point that everyone has little accidents and they are nothing to worry about. By the end of the book Millie is using her potty like a pro and Mo has even advanced to the loo. We were recently recommended this book by one of our followers and i’m really happy we bought it as it’s fantastic. Ivy has recently turned two and a half so tantrums are (unfortunately!) now a part of everyday life. This means I am always on the lookout for books which may alleviate the stress a little! 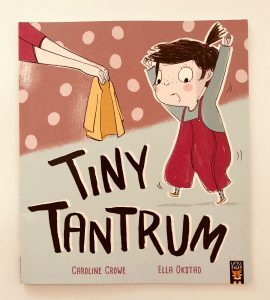 The story is about a little girl called Tiny who has lots of tantrums. Every time her mummy asks her to do something she yells and screams and stamps her feet, refusing to oblige. However one day she is joined by an array of fluffy monsters who help her understand that there are better ways of dealing with her anger. From wiggling your bottom to flushing your tantrums down the loo, these monsters have lots of creative ideas on how to get rid of the grumps. This one gets a big thumbs up from us as it makes Ivy laugh out loud. Additionally, there are lots of opportunities to put on silly monster voices and there’s a funky song at the end. 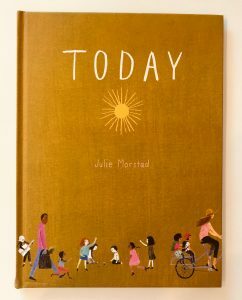 The illustrations are lovely and definitely capture the drama of being a toddler! 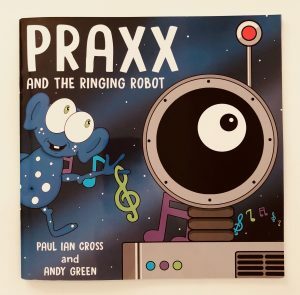 Praxx is a little alien who lives on a planet called Ekkadora with his mum and his best friend Zobott the robot. Praxx has lots of chores to do but he’s not a big fan of doing them himself so he sometimes enlists Zobott’s help. One morning Praxx is rudely awoken by Zobott who is making lots of strange, really loud noises – RING! BLEEP! CROAK! It transpires that Praxx had asked him to help out with tidying up – but he has put everything in the wrong place. The alarm clock, phone and the family pet are all inside Zobott’s tummy storage box, there’s a worm in mum’s handbag and their rocket has been parked in the house! Praxx learns an important lesson – always do your chores yourself else they might end up taking three times as long to fix! This funny book by Gareth Edwards and Guy Parker-Rees always makes Ivy laugh. It follows a little boy as he goes through elements of his day – but he has chosen some rather crazy animal friends to help him with each task! 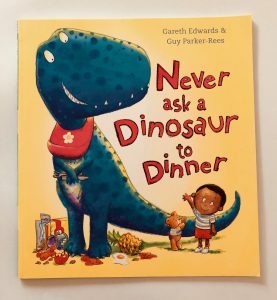 He eats his dinner with a dinosaur who gobbles everything up before he gets a chance to eat a single bite. He uses a tiger as a towel when he gets out of the bath – and unsurprisingly the tiger is a little cross! He even tries to use a giant bison as a blanket which proves a little uncomfortable. Follow him as he discovers why dinosaurs, sharks, beavers, tigers, bison and owls don’t always make the best companions. The rhyme scheme is really bouncy which makes it a lot of fun to read and it’s also a good book for discussion. A barn owl might not be the best thing to cuddle up to at night because of his sharp claws and nocturnal habits – so what might make a better bed fellow?